Redington Beach is a small town that is close to all of the main attractions in the St. Pete area. It is not as well known as many of the other towns in the area, but it is the perfect chance to get a little off the beaten path and enjoy a low-key Redington beach wedding ceremony. Redington Beach Weddings are great for the bride and groom that want to escape the city life and relax in paradise with their guests. You and your guests will enjoy lounging on the quiet beaches, and slower lifestyle that Redington Beach provides. A great way for you and your guests to escape the work life and get into beach wedding mode. While you are here for your Redington Beach Wedding, you must check out the well-known 1,200+ foot long Redington Long Pier. Get an incredible view of the crystal clear ocean, soft white sand and a view of the sunset you will never forget. We recommend having your Redington Beach Wedding Ceremony during the sunset hour. Your guests will be in awe as the sun sets during your Redington Beach Wedding Ceremony, making for the most romantic setting a bride could ask for. Cost-Effective: One of the misconceptions about beach weddings is that they are too expensive. The truth is that a wedding on a beach resort is actually more cost-effective than one at a local venue such as a hotel or party center. All you’ll have to pay for is your wedding package and resort stay, which can double as a honeymoon. You can keep your guest list count down and easily save thousands of dollars on your wedding and honeymoon by simply hosting one in Redington Shores. An Ideal Reunion: If you decide on a Redington Beach wedding, your guests will be together for a few days instead of just a few hours. This will allow you more time to spend time with your friends and family. On your actual wedding day, you won’t have to worry about greeting everyone and can truly have fun because you’ve already said your hellos and mingled. Unique Experience: You and your fiance can be that couple that creates a unique experience for yourselves and your guests. Rather than hosting a typical wedding at local venue that all of your guests are familiar with and have already been to many times, you can give them an excuse to experience the beauty of the Tampa Bay area. Less Stress: Let’s be honest. Wedding planning is no walk in the park. By hosting your wedding at beach resort and working with Your Florida Beach Weddings you won’t have to worry about a thing. All you have to do is provide us with a date and let us know which package meets your needs. We’ll handle the planning while you enjoy your time being engaged. Breathtaking Photographs: Once your wedding day is over, you’ll have your photos to look back on and relive the special moments. 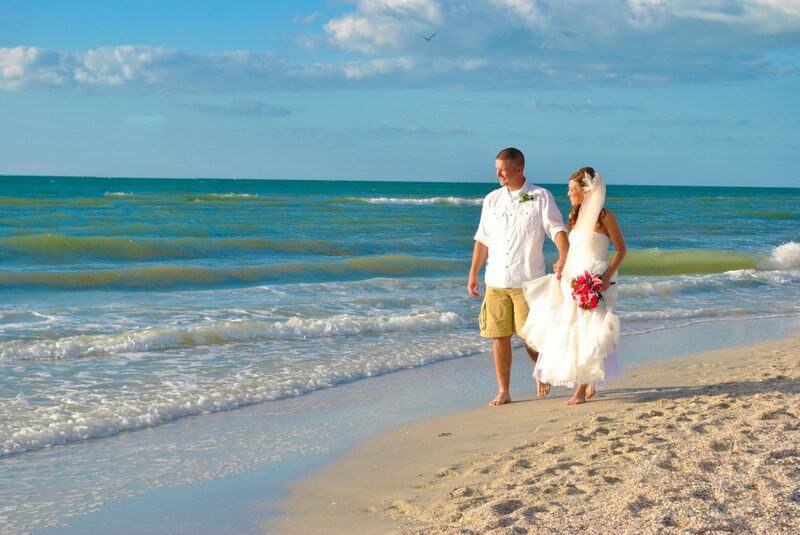 Redington Beach weddings come with gorgeous weather and stunning scenery that lead to breathtaking photos. 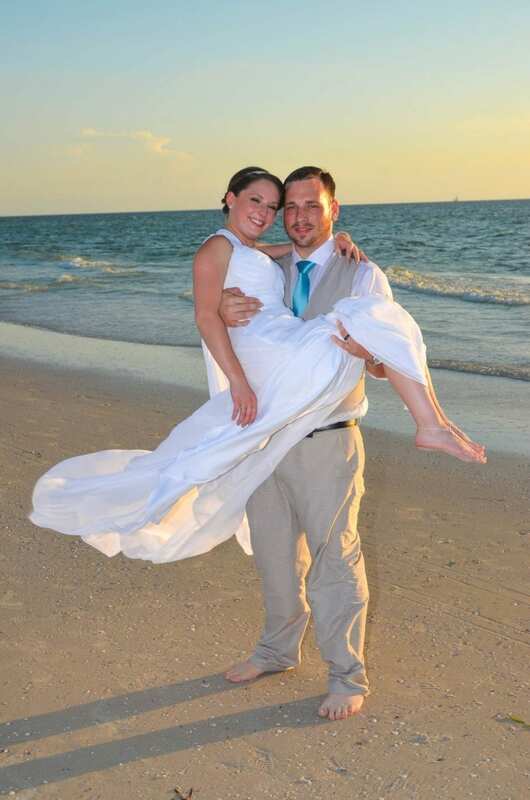 Speaking of breathtaking photos, all of our Florida Beach wedding packages include beach wedding ceremony photography. If you’d like, you can add additional photography time after the ceremony so that our highly trained and experienced photographers can capture group photos of all your guests, family photos, bridal party photos, and countless shots of you and your spouse to be. Regardless of whether you opt for the standard photography that’s included with your package or upgrade, you can download your photos for free. You’ll receive a link to download your photos and can request a photo CD for an additional cost. Simply Clearwater Elopement: If your goal is to escape reality and elope to the Redington Shores, the Simply Clearwater Elopement package was made for you. It’s only an option for groups with less than eight people in attendance including you and your future spouse. Clearwater Nautical Knot: If you’d like an intimate wedding with up to 35 participants, including you and your future spouse, you should consider the Clearwater Nautical Knot package. Gulf Beach Destiny: Gulf Beach Destiny was created for larger Redington Beach weddings. If you’re invite list consists of 50 or more participants, this package is right for you. It will allow you to actually enjoy having a larger wedding rather than coping with the stress that typically comes with planning one. Clearwater Distinctive Design: To add a touch of luxury and originality to your wedding, one of our many Clearwater Distinctive Design packages are the way to go. These packages include luxury details such as deluxe white resin chairs, a chalkboard announcing you and your fiance getting married, just married t-shirts, and a lemonade and water station to keep your guests and cool and hydrated. If you’re ready to wow your guests without having them travel outside of the United States, you will love a wedding on Redington Shores. What are you waiting for? Start planning your destination Redington Beach Wedding Ceremony with a professional and reliable beach wedding company. Check out all of our beach wedding packages here.